static std::string sDataPath = ""
Definition at line 48 of file llvfsthread.h. Definition at line 52 of file llvfsthread.h. Definition at line 73 of file llvfsthread.cpp. Definition at line 78 of file llvfsthread.cpp. Definition at line 60 of file llvfsthread.cpp. References LLQueuedThread::getPending(), LLThread::setQuitting(), sLocal, and LLQueuedThread::update(). Definition at line 46 of file llvfsthread.cpp. References llassert, LLVFSThread(), NULL, and sLocal. Definition at line 85 of file llvfsthread.cpp. References LLQueuedThread::addRequest(), LLVFSThread::Request::deleteRequest(), FILE_READ, LLQueuedThread::generateHandle(), llendl, llerrs, llmax(), LLQueuedThread::nullHandle(), and LLQueuedThread::PRIORITY_LOW. Definition at line 105 of file llvfsthread.cpp. References LLQueuedThread::addRequest(), LLQueuedThread::completeRequest(), LLVFSThread::Request::deleteRequest(), FILE_READ, LLQueuedThread::generateHandle(), LLVFSThread::Request::getBytesRead(), llendl, llerrs, llverify, LLQueuedThread::PRIORITY_IMMEDIATE, S32, and LLQueuedThread::waitForResult(). Definition at line 141 of file llvfsthread.h. Definition at line 53 of file llvfsthread.cpp. References LLQueuedThread::getPending(), sLocal, and LLQueuedThread::update(). Referenced by cleanup_app(), and main_loop(). Definition at line 128 of file llvfsthread.cpp. References LLQueuedThread::addRequest(), LLVFSThread::Request::deleteRequest(), FILE_WRITE, LLQueuedThread::generateHandle(), llendl, llerrs, and LLQueuedThread::nullHandle(). Definition at line 147 of file llvfsthread.cpp. 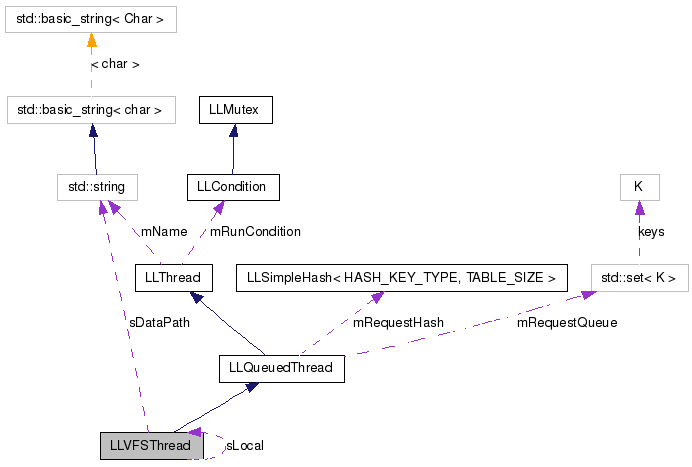 References LLQueuedThread::addRequest(), LLQueuedThread::completeRequest(), LLVFSThread::Request::deleteRequest(), FILE_WRITE, LLQueuedThread::generateHandle(), LLVFSThread::Request::getBytesRead(), llendl, llerrs, llverify, LLQueuedThread::PRIORITY_IMMEDIATE, S32, and LLQueuedThread::waitForResult(). Definition at line 114 of file llvfsthread.h. Definition at line 115 of file llvfsthread.h. Referenced by cleanupClass(), initClass(), LLVFile::initClass(), and updateClass().